The word root alkyl is encountered in several contexts. Alkylation is an important operation in refineries, for example in the production of high-octane gasoline. Alkylating antineoplastic agents refer to a class of compounds that are used to treat cancer. In such case, the term alkyl is used loosely. For example, nitrogen mustards are well-known alkylating agents, but they are more complex than a mere hydrocarbon. In chemistry, alkyl refers to a group, a substituent, that is attached to other molecular fragments. For example, alkyl lithium reagents have the empirical formula Li(alkyl), where alkyl = methyl, ethyl, etc. A dialkyl ether is an ether with two alkyl groups, e.g., diethyl ether (O(C2H5)2). Alkyl also refers to an active ingredient in green algae preventatives used in swimming pools. In medicinal chemistry, the incorporation of alkyl chains into some chemical compounds increases their lipophilicity. This strategy has been used to increase the antimicrobial activity of flavanones and chalcones. Usually, alkyl groups are attached to other atoms or groups of atoms. Free alkyls occur as neutral compounds, as anions, or as cations. The cations are called carbocations. The anions are called carbanions. The neutral alkyl free radicals have no special name. Such species are usually encountered only as transient intermediates, but some are quite stable and can be "put into a bottle". Typically alkyl cations are generated using super acids, alkyl anions are observed in the presence of strong bases, and alkyl radicals are generated by a photochemical reaction. Alkyls are commonly observed in mass spectrometry of organic compounds. The structure of 3-methylpentane is viewed as consisting of two parts. First, five atoms comprise the longest straight chain of carbon centers. 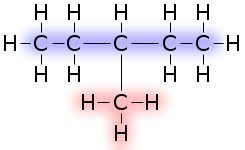 The parent five-carbon compound is named pentane (highlighted blue). The methyl "substituent" or "group" is highlighted red. According to the usual rules of nomenclature, alkyl groups are included in the name of the molecule before the root, as in methylpentane. This name is, however, ambiguous, as the methyl branch could be on various carbon atoms. Thus, the name is 3-methylpentane to avoid ambiguity: The 3- is because the methyl is attached to the third of the five carbon atoms. This compound is known as 2,3,3-trimethylpentane. Here three identical alkyl groups attached to carbon atoms 2, 3, and 3. These numbers are included in the name to avoid ambiguity on the position of the groups, and "tri" indicates that there are three identical methyl groups. 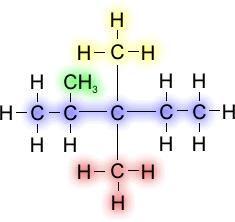 If one of the methyl groups attached to the third carbon atom were an ethyl group, then the name would become 3-ethyl-2,3-dimethylpentane. Note that when there are different alkyl groups, they are listed in alphabetical order. In addition, each position on an alkyl chain can be described according to how many other carbon atoms are attached to it. The terms primary, secondary, tertiary, and quaternary refer to a carbon attached to one, two, three, or four other carbons respectively. The first named alkyl radical was ethyl, named so by Liebig in 1833 from the German word "aether" (which in turn had been derived from the Greek word "aither") (https://en.wiktionary.org/wiki/ether , i.e., the substance now known as diethyl ether) and the Greek word ύλη (hyle), meaning "matter". This was followed by methyl (Dumas and Peligot in 1834, meaning "spirit of wood") and amyl (Auguste Cahours in 1840). The word alkyl was introduced by Johannes Wislicenus in or before 1882, based on the German word "Alkoholradicale" and then-common suffix -yl. Look up alkyl in Wiktionary, the free dictionary. ^ Mallavadhani UV, Sahoo L, Kumar KP, Murty US (2013). "Synthesis and antimicrobial screening of some novel chalcones and flavanones substituted with higher alkyl chains". Medicinal Chemistry Research. 23 (6): 2900–2908. doi:10.1007/s00044-013-0876-x. ^ Rocke, Alan (2012). From the Molecular World: A Nineteenth-Century Science Fantasy. Springer. p. 62. ISBN 978-3-642-27415-2. Ethyl radicals (named by Liebig in 1833 from the Greek and German word "aether" plus Greek "hyle"
^ Rocke, Alan (2012). From the Molecular World: A Nineteenth-Century Science Fantasy. Springer. p. 62. ISBN 978-3-642-27415-2. "Alkyl" was coined without fanfare by Johannes Wislicenus, professor at Würzburg; an early use (perhaps not the first) is in his 1882 article [22, 244]. The word was derived from the first three letters of "Alkoholradicale" combined with the suffix -yl; it was (and is) a generic term for any of those radicals who bear the "first names" methyl, ethyl, propyl, butyl, amyl, etc. ^ Wisclicenus, Johannes (1882). "Ueber die Schätzung von Haftenenergien der Halogene und des Natriums an organischen Resten". Ann. Chem. 212: 239–250. doi:10.1002/jlac.18822120107.